اطلاع از شرایط آب و هوایی فصل پیش رو امکان اتخاذ راهبردهای مدیریتی متناسب در مزرعه را فراهم ساخته و در کاهش هزینه‌ها و ریسک تولید نقش مهمی ایفا نماید. در این مطالعه، به منظور پیش‌بینی فصلی عوامل جوی و انتخاب دو گزینه مدیریت زراعی (تاریخ کاشت و مصرف نیتروژن) برای فصل آتی در شهرستان ایذه در استان خوزستان، از روش kنزدیک‌ترین همسایه (k-NN) اصلاح شده و مدل شبیه‌ساز رشد و نمو گندم CERES-Wheat استفاده شد. نتایج نشان داد که روش k-NN برای پیش‌بینی شرایط آب و هوایی و مدل CERES-Wheat جهت شبیه‌سازی عملکرد گندم از دقت مناسبی برخوردارند. از تلفیق روش پیش‌بینی فصلی k-NN با مدل CERES-Wheat تاریخ کاشت مناسب گندم دیم در منطقه مطالعاتی، بین 5 آبان تا اوایل آذر تعیین شد. مقدار نیتروژن مصرفی در سال‌های کم‌باران و سال‌های نرمال به ترتیب 50 و 150 کیلوگرم در هکتار پیشنهاد می‌گردد. این رهیافت می‌تواند به عنوان یک ابزار پشتیبان تصمیم در مدیریت زراعت دیم پیش از آغاز سال فصل زراعی در سایر مناطق اقلیمی مورد استفاده قرار گیرد. Seasonal weather forecast for the upcoming season may serve as a usefool tool for making management decisions which may decrease the production costs and associated risks. 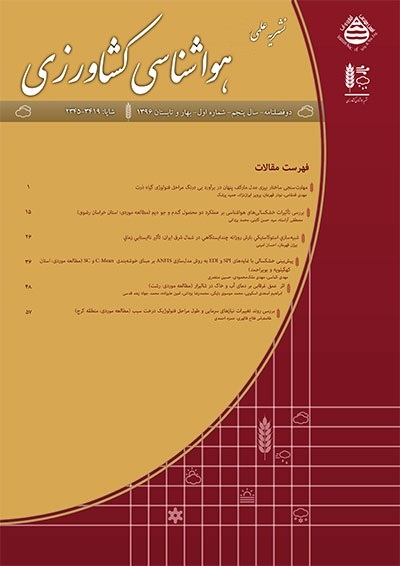 In this study attemps haven been made to combine a seasonal weather forecast approach based on k-NN nearest neighbor and dynamic simulation model CERES-Wheat model as a decision support system of farm management practices (planting date and nitrogen applicatin level) for rainfed wheat (variety Dehdasht) using the data of a field experiment at Izeh research station, Khuzastan province, Iran during 2015-2016 growing season. The results showed that the k-NN approach and CERES-Wheat model have an acceptable performance in seasonal weather forecast and crop growth simulation, respectively. By combining k-NN and CERES-Wheat models, the appropriate sowing time of the selected variety in Izeh region was determined to be between November 5 and early December. The recommended amount of applied nitrogen fertilizer in dry and rainy seasons are 50 and 150 kg ha-1, respectively. The proposed combined approach can be used as a suitable decision support system of rainfed crops in other climatic regions. Andarzian, B., Hoogenboom, G., Bannayan, M., Shirali, M., Andarzian, B. 2015. Determining optimum sowing date of wheat using CSM-CERES-Wheat model. Journal of Saudian Society of Agricultural Science, 14(2): 189–199. Asseng, S., Mclntosh, P. C., Wang, G., Khimashia, N. 2012. Optimal Nfertilizer managment based on a seasonal forecast. European Journal of Agronomy, 38: 66-73. Bannayan, M., Eyshi Rezaei, E., Hoogenboom, G. 2013. Determining optimum planting dates for rainfed wheat using the precipitation uncertainty model and adjusted crop evapotranspiration. Agricultural Water Management, 126: 56-63. Bannayan, M., Hoogenboom, G. 2007. Daily weather sequence prediction realization using the non-parametric nearest-neighbor re-sampling technique. International Journal of Climatology, 28: 1357-1368. Bannayan, M., Hoogenboom, G. 2008. Weather Analogue: a tool for real-time prediction of daily weather data realizations based on a modified k-nearest neighbor approach. Environmental Modeling and Software, 23: 703-713. Brandsma, T., Konnen, G. P. 2006. Application of nearest-neighbor resampling for homogenizing temperature records on a daily to sub-daily level. International Journal of Climatology, 26: 75-89. Brandsma, T., Buishand, T. A. 1998. Simulation of extreme precipitation in the Rhine basin by nearest neighbor resampling. Hydrology and Earth System Sciences, 2: 195-209. Capa-Morocho, M., Ines, A., Amor, V. M., Baethgeen, W. E., Rodríguez-Fonseca, B., Han, E., Ruiz-Ramos, M. 2016. Crop yield outlooks in the Iberian Peninsula: Connecting seasonal climate forecasts with crop simulation models. Agricultural Systems, 149: 75–87. Dumont, B., Basso, B., Leemans, V., Bodson, B., Destain, J. P., Destain. M. F. 2015. A comparision of within-season yield prediction algorithms based on crop model behavior analysis. Agricultural and Forest Meteorology, 204: 10-21. Farooq, M., Bramley, H., Palata, J. A., Siddique, K. H. M. 2011. Heat stress in wheat during reproductive and grain-filling phases. Critical Review in Plant Science, 30: 1-17. Gangopadhyay, S. M., Rajagopalan, C. B. 2005. Statistical downscaling using K-nearest neighbors. Water Resources Research, 41: 1-23. Hunt, L. A., Pararajasingham, S., Jones, J. W., Hoogenboom, G., Imamura, D. T., Ogoshi, R. M. 1993. GENCALC-Software to facilitate the use of crop models for analyzing field experiments. Agronomy Journal, 85: 1090-1094. Johen, T., Boettcher, U., Kage, H. 2012. A variable thermal time of the double ridge to flag leaf emergence phase improves the predictive quality of a CERES-Wheat type phenology model. Computer and Electronic in Agriculture, 89: 62-69. Jones, J. W., Hoogenboom, G., Porter, C. H., Boot, K. J., Batchelor, W. D., Hunts, L. A., Wilkens, P. W., Singh U., Gijsman, A. J., Ritchie, J. T. 2003. DSSAT Cropping System Model. European Journal of Agronomy, 18: 235-265. Kelmm, T., Mcpherson, R. A. 2017. The development of seasonal climate forecasting for agricultural producers. Agricultural and Forest Meteorology, 232: 384-399. Marletto, V., Ventura, F., Fontana, G., Tomei, F. 2007. Wheat growth simulation and yield prediction with seasonal forecast and a numerical model. Agricultural and Forest meteorology, 147: 71-79. Mvromatis, T. 2016. Spatial resolution effects on crop yield forecasts: an application to rainfed wheat yield in north Greece with CERES-Wheat. Agricultural Systems, 143: 38-48. Porter, J. R., Gawith, M., 1999. Temperature and growth and development of wheat: a review. European Journal of Agronomy, 10: 23-36.
forecasts in uruguayan rice production sector. In: Hansen, J.W., Sivakumar, M.V.K. (Eds. ), Climate Prediction and Agriculture. Springer, pp. 89–97. Semenov, M. A., Doblas-Reyes, F. J,. Martre, P. 2007. Utility of dynamical seasonal forecasts in predicting crop yield. Climate Research, 34(1): 71-81. Sharif, M., Burn, D. H., 2005. Simulating climate change scenarios using an improved K-nearest neighbor model. Journal of Hydrology, 325: 179-196. Spiertz, J. H. J., Hamer, R. J., Xu, H., Primo-Martin, C., Don, C., Van der Putten, P. E. L., 2006. Heat stress in wheat: Effects on grain growth and quality traits. European Journal of Agronomy, 25: 89-95. Thorp, K. R., Hunsaker, D. J., French, A. N., White, J. W.,Clark, T. R. Pinter, J. P. J. 2010. Evaluation of the CSM-CROPSIM-CERES-Wheat model as a tool for crop water management. American Society Agricultural and Biological Engineers 53: 87-102. Wahid, A., Gelani, S., Ashraf, M., Foolad, M. R., 2007. Heat tolerance in plants: An overview. Enviromental and Experimental Botany, 61: 199-223. Yates D., Gangopadhyay, S., Rajagopalan, B., Strzepek, K. 2003. A technique for generating regional climate scenarios using a nearest neighbor algorithm. Water Resources Research, 39(7): 1199. Zahedi, M., Jenner, C. F., 2003. Analysis of effects in wheat of high temperature on grain filling attributes estimated from mathematical models of grain filling. Journal of Agricultural Science, 141: 203–212. Zinyengere, N., Mhiza, T., Mashonjowa, E., Chipindu, B., Geerts, S., Raes, D. 2011. Using seasonal climate forecasts to improve maize production decision support in Zimbabwe. Agricultural and Forest Meteorology, 151: 1792-1799.